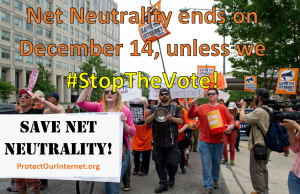 On December 14, Verizon lawyer Ajit Pai, who is currently serving as chair of the Federal Communications Commission, FCC, will bring his proposal to dismantle net neutrality for a vote. There are two other commissioners who support Pai’s plan, and two who oppose it, so it will pass unless we take action to save net neutrality now. We faced long odds before and prevailed. In 2014, FCC Chairman Tom Wheeler proposed rules that would create a tiered Internet. In a short time, the actions of many pushed Wheeler to include reclassifying the Internet as a common carrier (like a public utility) so that net neutrality would be protected. Then, a sustained campaign for the next nine months swayed three commissioners to vote for reclassification. We won, beating the millions of dollars that telecoms used to try to stop us. Now, we must act again. It is no surprise that Pai decided to kill net neutrality in mid-December. This is the time of year when Washington does its worst dirty work because people are distracted with holiday shopping and parties. We must prove that we are watching and that we won’t let net neutrality die. The momentum to stop the vote is rising, let’s keep building it! 1. Contact Congress – Pai is hellbent on ending net neutrality because he knows that the profits for Verizon, Comcast and AT&T will be huge. 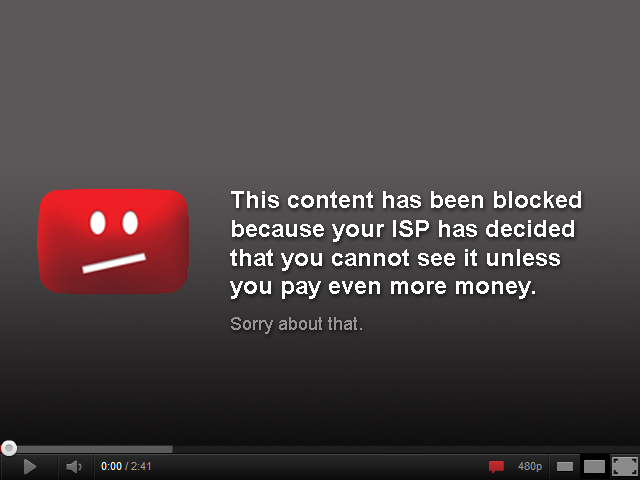 The Internet will become like cable TV where the telecoms can charge you more to access certain content. But members of Congress can intervene to call on Pai to back down. 2. Join the National Day of Action – On December 7, a week before the vote, hundreds of protests are planned at Verizon stores across the country. Click on the link below to find an action near you or to plan your own. CLICK HERE TO PROTEST VERIZON. 3. Stop the Vote Action at the FCC – On December 13, at 4:00 pm, we will gather at the FCC in Washington, DC and we are staying through the night and into the morning to stop the vote. Join us for part or all of the vigil. We’ll project messages on the FCC, bring our giant telephone to remind folks to contact Congress and we’ll plan to peacefully stop the vote from happening. If you can make it, register below so that we can be in touch with you about the details. If you can’t make it, plan a vigil of your own. Contact us at info@popularresistance.org with the details and we’ll post it so that others can find you. Good places to vigil are members of Congress’ offices, Verizon stores, FCC regional offices or highly trafficked public spaces. And if you can come early, there will be a protest from 10 am to 2 pm. See March For Net Neutrality for details. Advocate change by developing movements like Black Lives Matter, NoDAPL, etc. Big cable companies like Comcast and Verizon are looking out for their bottom line, not our ability to organize, communicate and express ourselves — that’s why we’re giving it our all to fight again for the internet as we know it. Take action now to save net neutrality! lol, crickets. I love all the happy activists holding their super cute signs smiling bigly as if they are attending a party. 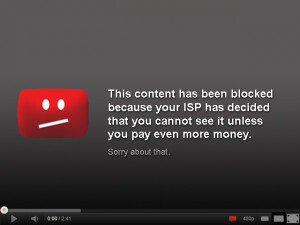 Get ready to watch net neutrality go right down the drain. I can hear Obama laughing, no difference between parties. Everything people worked hard for over the past 2 decades is being erased in an instant and the courts are being packed with right wing lunatics ensuring our children a miserable future. Wait till you see what the GOP has planned for the the 2020 census. But but…Zeese says that Bernie was a sheepdog. Ralph Nader, my favorite American, although he advocates for a third party to break the duopoly, supported Bernie and groups like Our Revolution. Will happily support Ben Jealous for governor of Maryland. See all sane people at the rally in Baltimore on Dec 6.